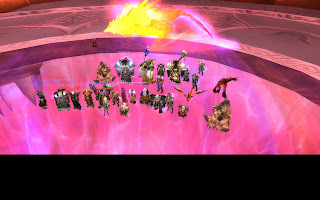 After 2 days of learning (this thursday and last weeks tuesday), we got Al'ar in overtime. He dropped a nice cloak, a little upgrade, but every little thing helps. And I like PoJ, I repeately beat the warrior to platform 1, while I was coming from 2. Now, next week, we have 2 days for Kael'thas Sunstrider...uh-huh.